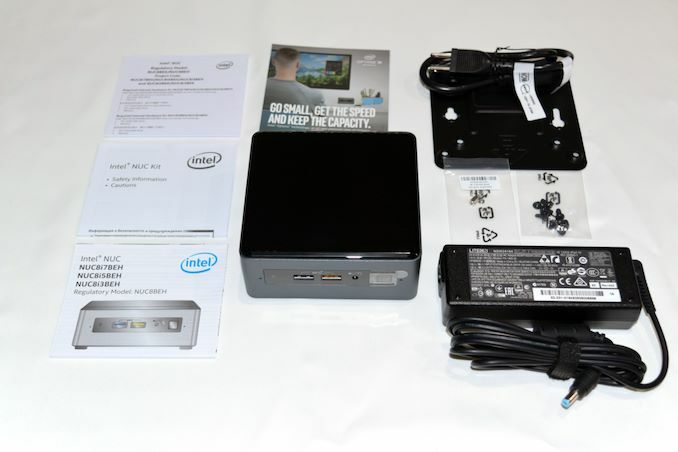 Intel's NUCs have managed to develop a strong market for ultra-compact form-factor (UCFF) machines since they were introduced in the early 2010s. Each CPU generation has seen Intel put out stronger versions of the NUC (both in terms of performance and features) in a regular cadence. In parallel, we have seen experiments with slightly larger form-factors (such as the Skull Canyon and Hades Canyon NUCs). Currently, Intel has NUC platforms targeting three different market segments - the entry-level, mid-range, and enthusiast. While the entry level is served by Atom-class SoCs and the enthusiast category by H-/G-series CPUs, the mid-range is served by the U-series SiPs (system in package) that use the Core microarchitecture. Today, we are looking at Intel's latest flagship in the mid-range segment - the Core i7-based Bean Canyon (NUC8i7BEH). The TDP upgrade (15W to 28W) makes it necessary for Intel to supply a 90W power adapter with the Bean Canyon NUCs (compared to the 65W ones supplied with the Baby Canyon models). 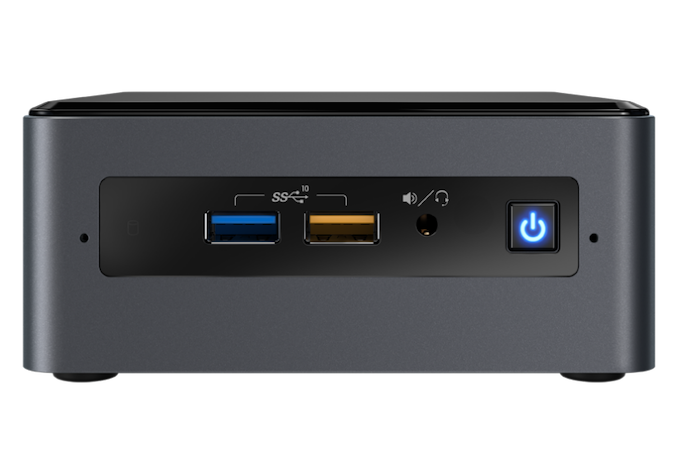 The NUC8i7BEH that we are looking at today comes with a Core i7-8559U processor. The 'H' in the model indicates a tall kit with support for the installation of a 2.5" SATA drive. The kit is available barebones, and users need to install either a SATA or a M.2 2280 / 2260 / 2242 NVMe drive and appropriate DDR4 SO-DIMMs. We utilized a Western Digital Black NVMe SSD and two G.Skill DDR4-3000 SODIMMs to complete our build. 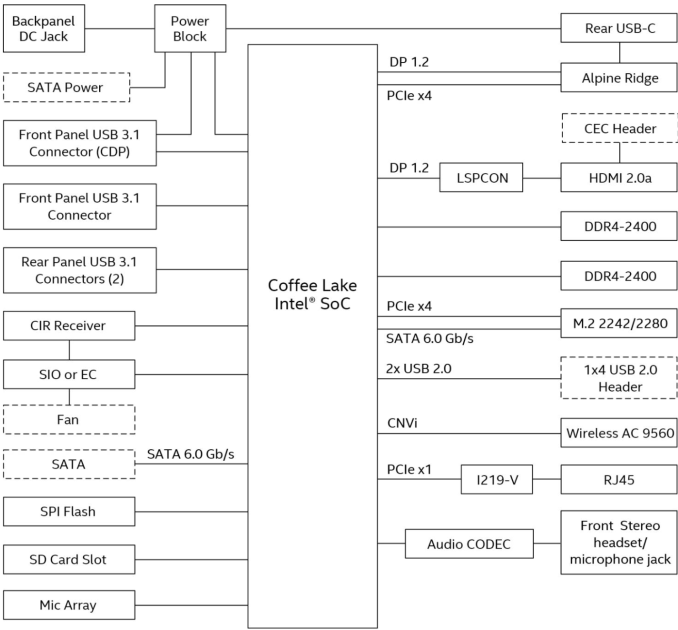 The specifications of our Intel NUC8i7BEH (Bean Canyon) review configuration are summarized in the table below. The Intel NUC8i7BEH (Bean Canyon) kit comes with a quick-start guide, hardware for VESA mounting, bunch of screws for installing the storage drives, and a 90 W (19V @ 4.74A) adapter with a US power cord. The Core i7-8559U package integrates an Intel Cannon Point-LP platform controller hub (PCH). Intel's documentation describes the board layout in detail. The integrated PCH enables four USB 3.1 Gen 2 ports that are present as Type-A ports in the front and rear of the chassis. CFL-U also supports CNVi, the new 'integrated connectivity' feature that puts the Wi-Fi and Bluetooth MAC inside the PCH. In the NUC8i7BEH, the CRF (companion RF) module completes the Wireless-AC 9560 by implementing the signal processing, RF, and analog functions. The Intel Wireless-AC 9560 is a significant upgrade over the Wireless-AC 8265 in the Kaby Lake NUCs. It comes with Wave 2 features, including support for 160 MHz channels and downlink MU-MIMO. The 2x2 WLAN module is theoretically capable of 1.73 Gbps bandwidth. It also integrates dual-mode Bluetooth 5 support. Intel continues to use a LSPCon on board to convert the Display Port 1.2 output of the processor to a HDMI 2.0 port with HDCP 2.2. Unfortunately, stereoscopic 3D is not supported in this configuration. However, the Thunderbolt 3 USB Type-C port's display output is compliant with HDCP 2.2 also. In the table below, we have an overview of the various systems that we are comparing the Intel NUC8i7BEH (Bean Canyon) against. Note that they may not belong to the same market segment. The relevant configuration details of the machines are provided so that readers have an understanding of why some benchmark numbers are skewed for or against the Intel NUC8i7BEH (Bean Canyon) when we come to those sections. 1. Firmware upgrades locked you out if you used Bitlocker (as in no rescue key, bye bye everything). At least it now warns you to suspend Bitlocker, but if lenovo can manage these upgrades seamlessly, why can't Intel? 3. DP/HDMI implementation. Won't sleep my screen correctly so the keep coming on every few minutes. Have to turn them off at the switch. I also have a Intel Nuc. How can I do a firmware upgrade? If everything is working... do not update. Intel has a download center for drivers and whatnot. You can find it by doing an internet search for Intel Download Center or by just going to downloadcenter dot intel dot com (I'm not sure what the policies are here for posting URLs). The simplest way to get all the driver and BIOS updates is likely to run their latest generation update detection tool by clicking "Get started" next to where it says "Automatically update your drivers". This should be visible on the main landing page for the Downloadcenter.